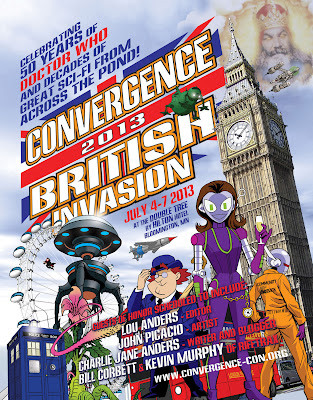 CONvergence, you were amazing. Was honored to be your Artist GoH this weekend, and even better that I was there with friends like Lou Anders, Paul Cornell, Melinda Snodgrass, and Charlie Jane Anders as fellow GoHs. For Lou and me, this was an especially unforgettable weekend, as this was our first time being GoHs on the same slate. Thanks to all who attended my programming items, and had such kind things to say after they were over. If I lit your fire, then that makes me happy. Loved hearing the gasps, the 'oooh's and the 'aaaah's from the audience when Loteria images were presented at various events. I can feel the Lone Boy / Loteria wave surging and growing, every time I show these. Thanks to all who bought my art and prints in the Art Show. I heard that the show did VERY well financially and that pleases me greatly because part of my Artist GoH job is to drive traffic to that aspect of the con. Congrats to the con com on a record-breaking attendance of 6789! Too many hard-working con com folks to thank all at once, but Tim Wick, Michael Lee, Christopher Jones, Tanya Brody, Charlie Horne, Teresa Knipp, Ishmael Williams, Doug Yoder, Anton Peterson, and EVERYONE who made this event happen -- take a bow while thunderous applause washes over you. And while you're doing that -- please take note and direct tsunami waves of thunderous applause to one of the greatest Guest Liaisons in the Hallowed History of Guest Liaisoning. Carly Buchanan was my GL this past weekend, and she did an exemplary job. She's a major talent and she made things HAPPEN, as the best ones do. I was incredibly fortunate to have her riding shotgun with me on this event. She came. She saw. She rocked. Take note, CONvergence comcon, pros, and fans -- you're very lucky to have her as part of your scene. I've never seen a convention where perfect strangers, pro and fan alike, break out into a spontaneous, cacophonous rendition of 'Bohemian Rhapsody', but I have now. And there's nothing like it. Be proud of yourselves, CONvergence. You're one of the most wonderful, dynamic, and energized power stations of sf/f energy. It's the only regional con on this planet Earth that feels like Mardi Gras channeled through Fiesta Noche Del Rio, funneled through a raucous Irish pub, while cliff-diving into the riot of your best dreams. You're a class act, and we shall meet again. Good news! SPECTRUM 20 Selections!